For some reason the action the past few weeks 'feels' much more bullish than it has been. The S&P 500 is only about 20-25 points (less than 2%) above where it was about two weeks ago - perhaps the shaking off of a lot of neutral to poor news is what is causing me to feel like the bulls are winning. The fact we also rally on the exact same leaks (rally 182 on Greece, rally 23 on debt ceiling) seems to be cute as well. Could also be the leadership stocks ala Apple, Netflix, Lululemon are strong like ox. 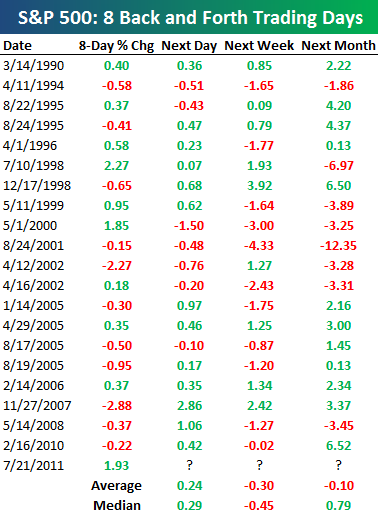 Coming into today, the S&P 500 had done something it only had done 42 times in the past 85 or so years per Bespoke... .put in a serious of eight consecutive up/down days. The knee jerk reactions to every political headline, or even rumor of a coming political headline are causing whiplash. 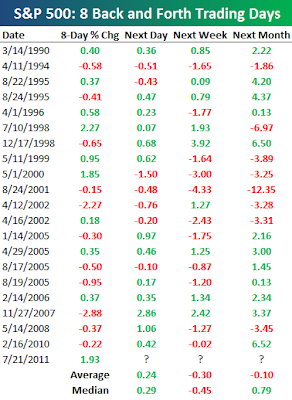 Going back to 1928, the S&P 500 has had a down,up,down,up,down,up,down,up pattern just 42 times. Below we highlight the 21 times that it has occurred since 1990. As I said coming into the week it is dangerous territory to short ahead of what will definitely be some sort of agreement on the debt ceiling as market participants will "be surprised" and rally the market. Even a rumor of a deal yesterday caused a surge. I'd like to see bulls get over 1360, and then of course 1370 - maybe "M&A debt ceiling deal agreement Monday" will do the trick.